After leaving Western Electric in 1949, I went to "shape up" at Satskys where Uncle Sal was working as a truck driver. "Shape up" meant that Satskys'employees would have to report for work every morning in the hopes that there would be work available for them. I had to buck all the regular employees, plus any drivers who might not be employed and were looking for work at the labor hall. I was lucky to get one or two days of work a week. I often got midnight work, or work at odd hours when no one else was available. I also had to join the Truck Drivers Union, which cost me money, even though I wasn't working steadily. One day I happened to talk to another A&P truck owner, and he mentioned that he was looking for a mechanic and driver. So I applied for the job. He liked my references and hired me. I worked at A&P for about a year, and then things slowed down and I went to work for Glasofer Truck and Sales Service, located on Highway 1 in Elizabeth, New Jersey. I was hired as a truck mechanic and worked on other vehicles as well. Glasofer's was a new and used car and truck dealer. They sold and serviced Brockway trucks and Willys cars and Jeeps. I worked there about three years, servicing mostly new and used trucks. We also serviced commercial tractors of all makes. We had about four mechanics, a service manager, the owner and some sales personnel. The top mechanic was a German named Andy, although there was no accent in his speech. He had formerly worked with Brockway Trucks as a service manager, and he was sharp. Once he had made a careful analysis of what was wrong with a truck, he was firm in his convictions. The service manager and office personnel were in awe of him. He took a liking to me and taught me all the facets of engine repair, plus transmissions and rear-end units. I would often turn to him for assistance and he was always ready to help me. We had a good relationship between us, often in a very humorous sense. It was while working at Glasofer's that I learned that water will travel uphill. It seemed that most of our new Willys cars and Jeeps would develop a dampness in the inner top liner of the car after a rainfall. We research the problem, but could not find the cause. We called in the factory representative, and he checked the vehicles and said that it was caused by water traveling up hill. Apparently with the heavy rains we had been having, water would seep into the door panel via the windows, even if they were closed tight. The water would drain to the bottom of the panel, where it was supposed to drain off through some drain holes in the bottom of the door. However, the panels did not have any drain holes, so when the accumulation of water had built up to the level of the upholstery, it would be sucked up like a wick in an oil lamp. That's how the top inner liner became damp. After we drilled a few drain holes in the bottom of the door panel, the problem went away. In 1955, I left Glasofer's because truck sales were slowing down, and the union contract called for only two mechanics. So I left and went to shape up at Lozowick Truck Company. Lozowick was a fleet operator who had 36 tractors and trailers, and hauled copper wire for Phelps Dodge, a manufacturer located in Elizabeth, New Jersey. 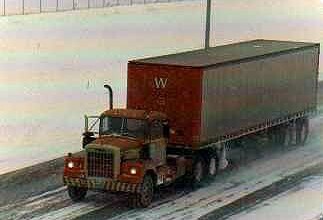 Phelps Dodge was such a large company that they had many trucking companies hauling wire for them. A friend of mine from A&P was working at Lozowick's and suggested that I shape up there, and maybe I'd get some work. Lozowick was a 50-50 barn, with half whites and half blacks. They did not like whites shaping up, just blacks, but I stuck it out and occasionally I would get a truck run to Yonkers, New York, or a large reefs (refrigerated trucks) to Pennsylvania. But I was eager to get back into truck repair work, which I really liked, so I was always volunteering to help the other mechanics who took care of the tractors and trailers. The owner, who was a very tough gun-carrying operator, found out about my mechanical ability and placed me in road service jobs when needed. He sometimes put me in a job ahead of senior drivers. The shop steward, who was black, didn't like it, but he took his orders from the owner--or else. No one was going to tell the owner how to run his business-union or no union. I stayed there until 1958, when we moved to Florida.